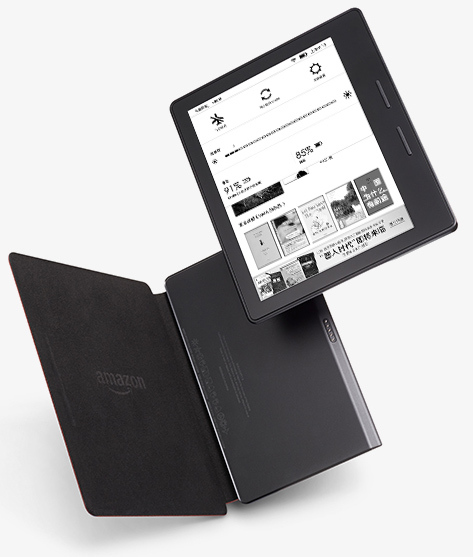 We’ve all been expecting Amazon CEO Jeff Bezos to unveil the company’s eighth-generation Kindle at some point this week. Bezos has already been on record to inform the technology-loving world that the new Kindle will be a “top of the line” device, an outburst that in itself has managed to increase expectation and excitement ahead of the official reveal. We are yet to actually have the pleasure of Amazon’s CEO taking to the stage to make an official Kindle announcement, but it looks as though the new Kindle’s images and specs may have leaked ahead of time, only to be quickly removed. Thanks to the leak, we now know that the soon-to-be-officially-announced eight-generation Kindle will be released under the Kindle Oasis name. The leaked images suggest Oasis will feature a radical redesign that introduces a rather large side bezel on one side that houses the page turn buttons, allowing the user to flick seamlessly through pages of a book without smudging the display. The Kindle Oasis will also pack a built-in accelerometer which would allow users to view the displayed content in various orientations. This allows the buttons and bezels to be placed on either side depending on the user preference, and make way for a true one-handed operation. The overall physical design of the new Kindle is also hugely different from what owners of previous-generation hardware would expect. The Oasis comes with an almost wedge-style design that is presumably in place due to the fact that the button side of the hardware also houses the battery that powers the device. 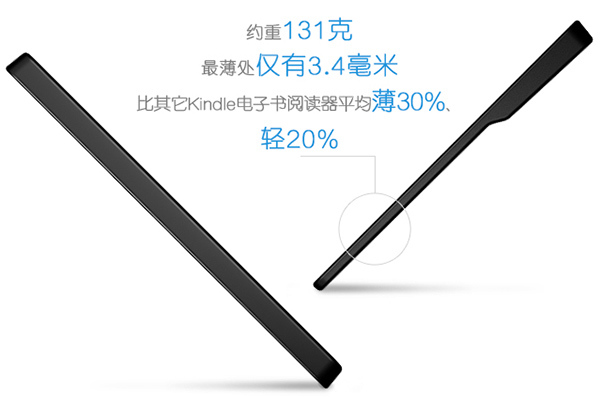 Speaking of the battery, the information leaked also suggests that Amazon will be offering a separate battery cover case that will not only increase the battery life of the Kindle Oasis, but will also even out the design by making the hardware flat on the back when it’s in place. That alone will probably convince a number of consumers to buy the accessory. Well, that and the fact that the battery cover case will provide a standby time of – wait for it – 20 months! 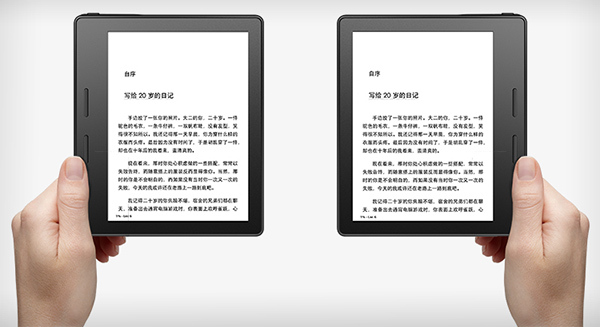 There also appears to be a new “Kindle Sleep mode” which would further increase the battery timing. Additional hardware specifications include a display that offers 300 pixels-per-inch, as well as an LED backlight that comes with 60% more light sources over previous models. The thickest point of the Oasis measures in at 8.5mm thick, with the thinnest part measuring in at just 3.4mm. That’s all good but it appears that Amazon has not thrown waterproofing into the mix here, which is a bummer honestly. 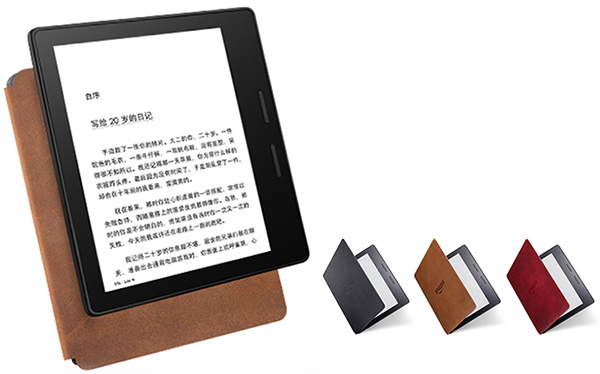 Apparently, Amazon will be offering the Kindle Oasis in black color while the battery cover case accessory will come in three different colors: brown, black and red. We’re still expecting an official announcement sooner rather than later, but at least now we have an idea of what to expect.